With its traditional barroom look and stylish blade handles, the Kohler Essex bar sink faucet brings classical flair to your entertainment area. 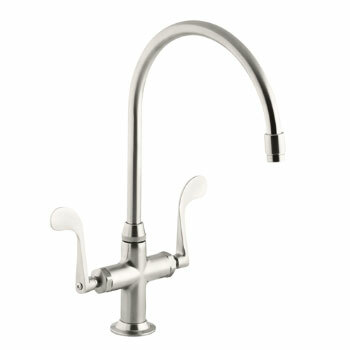 The high-arch, gooseneck swing spout offers plenty of room for prepping food and drinks as well as handling cleanup tasks, making it easier to entertain large groups. 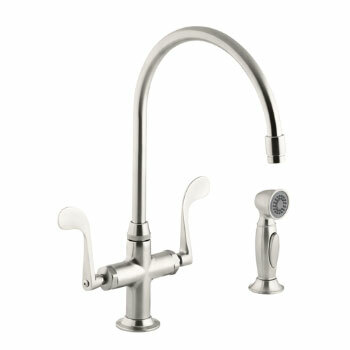 The Essex Kitchen sink faucet brings classical flair to your kitchen. The convenient sidespray allows for effective, up-close cleaning and easy food prepping. The blade handles are easy to turn off and on, even when your hands are full. * Two blade handles offer separate control of hot and cold water. 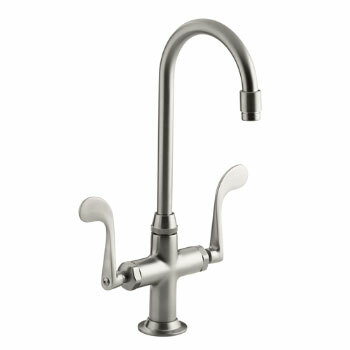 * High-arch gooseneck swing spout offers superior clearance for filling pots and cleaning. * Ceramic disc valves exceed industry longevity standards, ensuring durable performance for life. * KOHLER finishes resist corrosion and tarnishing.